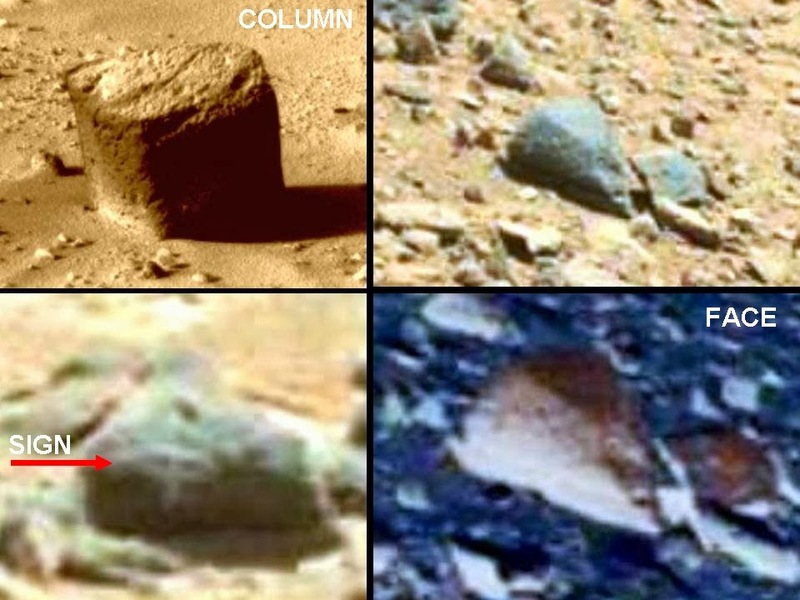 Discovery Of Egyptian column ancient on Mars and some other strange objects: A sign on a rock and a face. It looks like a small part of a column but it also could only be a stone with that kind of shape. Comparing it to egyptian columns is misleading information because there is no single relation to this. Or did anyone discover egyptian writings on that alleeged column on mars? This appears to just be a stone which has been eroded and weathered down over many ages. Discovery of rock on ground........! IMHO, the shape of the "rock" could suggest the possibility of having been a column (Egyptian or otherwise) but I don't think we can say anything definitive with what is shown in the image. What is interesting to me about the face is that the shape looks like some of the elongated skulls that have been found on this planet. I believe that the image on the lower left could be a cross symbol. I found two "Stars of David" on two different Themis Odyssey live images recently. Of course, no one can say what that symbol meant to the Martians probably a good 3 to 4 billion years ago but nevertheless my draw dropped when I found them. And not one person can see all those heads or masks lying amoung sand? Take another good look. They are there.